Our Jr. Penthouse has a spacious and open layout and is well situated on the fourth floor. 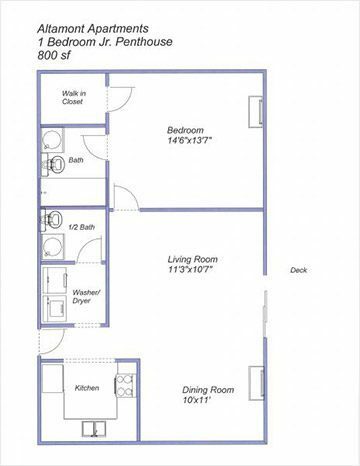 All penthouses have an additional half bathroom, their own washer and dryer in the unit, and private balcony. We try to solve all property rental issues as quickly as possible, so you have minimal disruption. There is contact information for each property on their individual pages. A CODE BLUE THANK YOU! Altamont Apartments is a four story 230-unit apartment complex designed for senior (55+) living. This complex offers many amenities including: air conditioning, pool, spa, elevators, movie theatre, fitness room, party tables, cards and other games.